It’s easy to tune out the rest of the world when you don your headset and start blasting terrorists in a game such as Battlefield 4. Your significant other or your roommates, on the other hand, are all too aware of the fun you’re having. And they’re none too happy about the cacophony of your PC. It’s roaring like a jet engine as its power supply strives to feed the computer’s components enough juice, while its myriad cooling fans spin up mini cyclones to keep the works cool. With a machine like AVADirect’s Quiet Gaming PC, nobody has to put up with that racket. 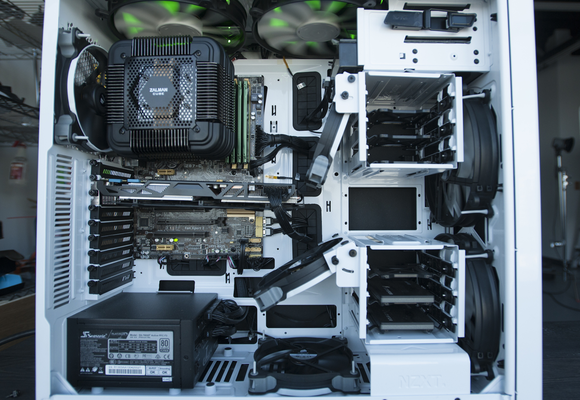 It’s not an over-the-top behemoth—and it’s not priced like one—but it is a very capable gamer. And it’s nearly silent. This $2,542 tower out-games systems costing thousands of dollars more, and it has more than enough oomph for a home-office system, too. That’s not a bad price for a PC with this much horsepower: There’s an unlocked Intel Core i7-4770K processor, 16GB of DDR3/1600 memory, and a single Gigabyte GV-N780OC-3D video card with an Nvidia GeForce GTX 780 GPU and 3GB of GDDR5 memory for starters. Storage comes in the form of a solid-state boot drive (a pair of 120GB Kingston HyperX SSDs operating in RAID 0) and a 2TB mechanical hard drive (a Western Digital Caviar Black). 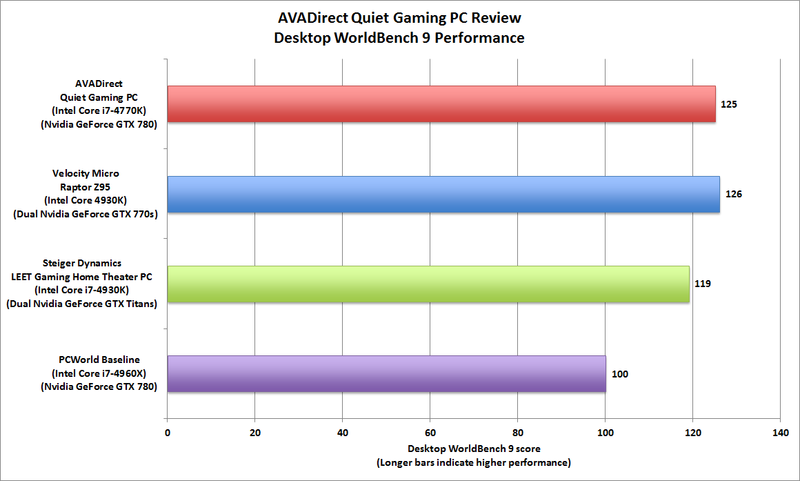 AVADirect makes just a few compromises in the design of its Quiet Gaming PC. The inability to run a second Nvidia-based video card is the most significant. The Quiet Gaming PC lives up to its low-decibel name: The system pads along so stealthily that the only thing people will hear is your rapid-fire clicking and clacking of the mouse and keyboard keys. Speaking of which, you’ll pay extra for those and a display; but that’s par for the course for custom-built rigs. AVADirect took many steps to dial down the din, including stashing the mechanical hard drive in an insulated noise-dampening case, lining the insides of the side panels with a 1/4-inch of dense foam padding, and mounting eight large cooling fans all over the inside of the NZXT H630 enclosure. 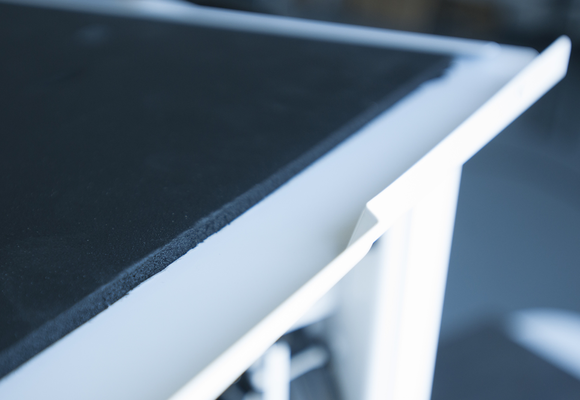 The insides of the right and left side panels are covered in dense sound- and vibration-deadening foam. As reviewed, the system has two 200mm case fans in front and two up top (venting through channels on the side). A series of three 140mm fans draw up air from the bottom and pivot to push it over the video card and the passively cooled CPU (a Zalman FX100 Ultimate Fanless Heatsink handles that job). A fourth 140mm fan pulls air out of the back of the rig. The number and size of these slow-spinning fans delivers the same cooling power more quietly than a few faster, noisier fans could. This front-mounted fan controller boasts a touchscreen display. 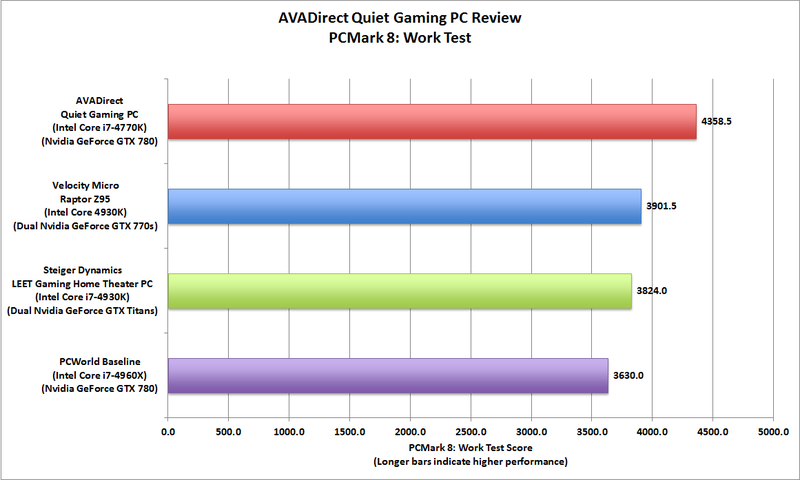 As a result, AVADirect’s Quiet Gaming PC not only runs quiet, it also runs cool. Even when I hammered away on demanding games like Battlefield 4 and Company of Heroes 2, I felt only a pleasant and merely warm breeze streaming out of the back of the tower. Bear in mind this configuration leaves lots of open space inside the case—there’s very little to obstruct air flow. 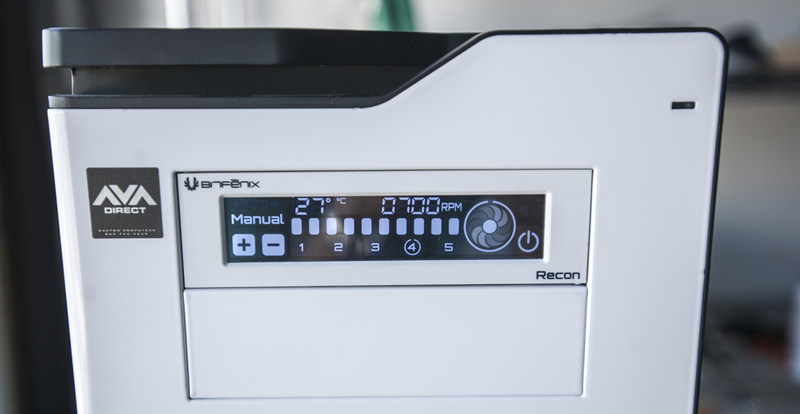 Should you decide to add a second video card (more on that topic later), you’ll want to monitor temps carefully (the presence of a Bitfenix Recon touchscreen fan controller will help with that). You might also need to upgrade from the 760-watt Seasonic power supply. 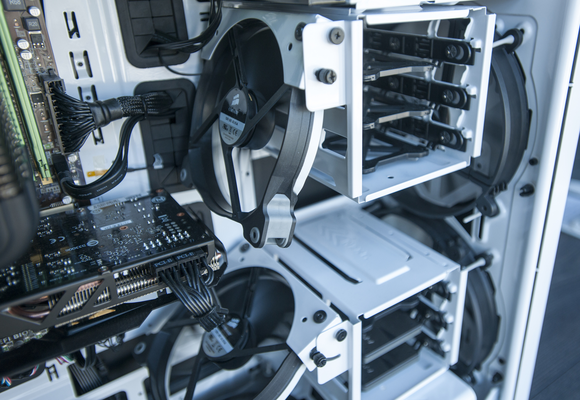 A fan at the bottom of the case draws outside air in, and these next two fans pivot to push the air over the video card and the passive cooler on the CPU. 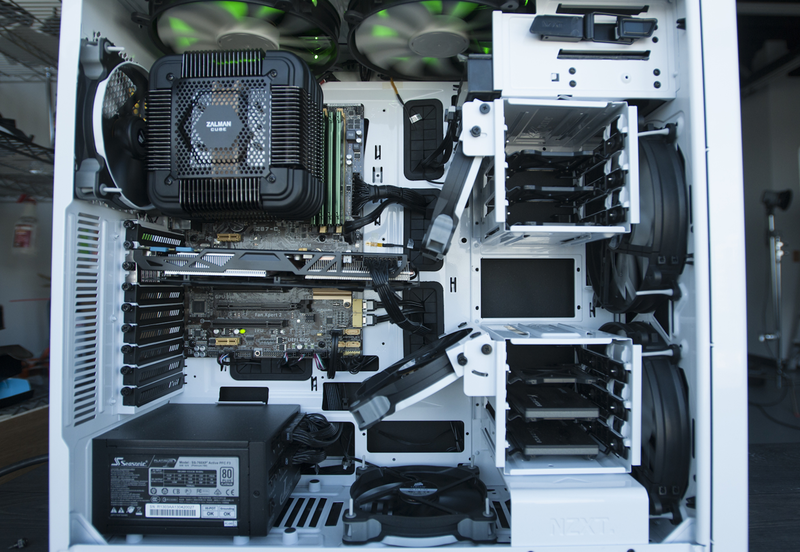 The Quiet Gaming PC’s looks are equally muted. Instead of sports-car-like curves, see-through windows, and scads of multi-colored LEDs lighting up its case like a disco, this glossy-white tower looks relatively understated. 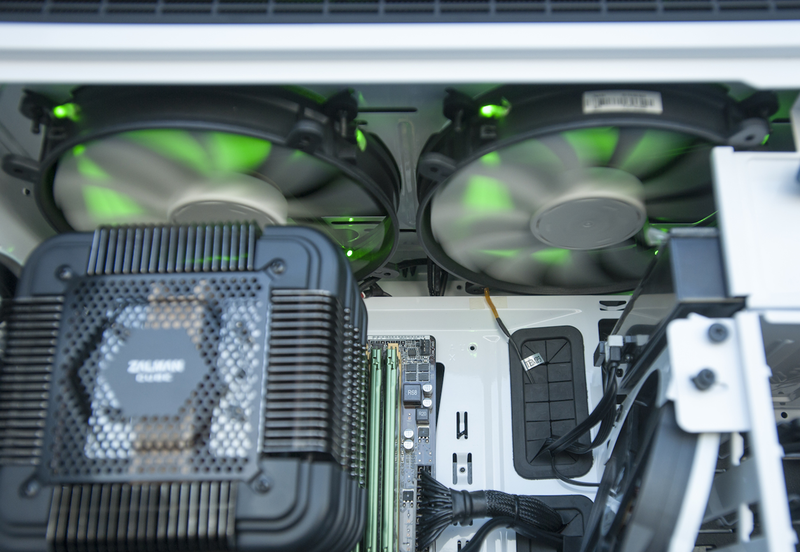 A set of LEDs mounted near the top of the case lend a gentle green glow—so it doesn’t look too much like a kitchen appliance—but that and the aforementioned fan controller are the only elements of gaming-box bling you’ll encounter. Two more large fans mounted at the top of case pull warm air out of the chassis. Soft-green LEDs add a bit of ambiance. Going under the hood, this tower looks and feels well put-together. The builders tightly seated and secured the cards and other components, and what few cable bundles I found are well harnessed and neatly tucked away. My only concern: The Zalman CPU heat sink cage rotates about ten degrees on its axis. The cage clears the surrounding fan blades by more than half an inch, but I'd prefer the cage didn’t move at all. The front panel has four USB ports (two of which are USB 3.0), and SD card reader, a headphone jack, and mic input. Most gamers will be pleased by this PC’s prowess. Displaying to a Dell 30-inch 30-inch UltraSharp 3008WFP monitor set to 2560x1600 resolution, it played even the most demanding games so smoothly and with such vivid video, I was totally sucked into the action. Playing Grid 2, I never failed to feel the thrill as I blew by another racecar in my Mustang Boss, or got a pit in my stomach as I crashed through the guardrail on the winding California coastal highway and plunged toward the rocks below. Our benchmarks merely confirm the obvious: At the highest-res settings—the same 2560x1600 I used for my game-playing—the Quiet Gaming PC blasted through our Battlefield 4, BioShock Infinite, and Grid 2 scripts at 55, 67, and 119 frames per seconds respectively. Those frame rates are high enough to yield seamless realistic video even for these graphically intensive games. 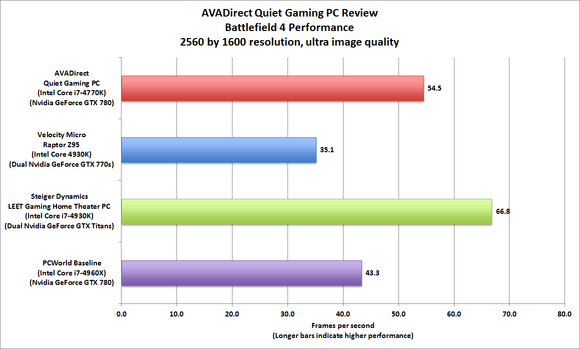 AVADirect's Quiet Gaming PC delivered a fluid Battlefield 3 performance at very high resolution even though it has just one video card. AVADirect’s rig works as hard as its plays, letting you earn the bread to feed your gaming habit. 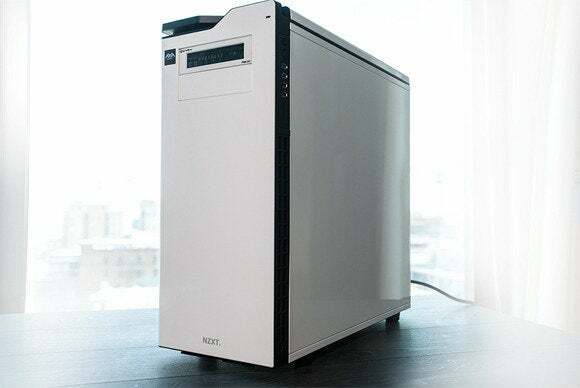 It delivered a scorching Desktop WorldBench 9 score of 126, 25-percent-better performance than our PC World home-brew reference system, which is decked out with an Intel Core i7-4960X Extreme Edition CPU, 16GB of DDR3/1600 memory, and an Nvidia GeForce GTX 780 video card. Be aware, however, that your expansion opportunities are limited by AVADirect’s sonic pursuits. The boutique builder doesn’t recommend adding a second video card, for example, because it would add noise. If down the road you decide to trade a modicum of noise for even better gaming performance with a second video card, you should know that the Asus Z87-C motherboard does not support Nvidia’s SLI dual-GPU technology. This machine walks softly and carries a big stick, delivering a Desktop WorldBench 9 score 25-percent higher than our baseline. It does support AMD’s CrossFire technology, but that means you’d need to toss that Nvidia card and buy two cards based on AMD GPUs. You should also know that the Asus Z87-C has just one PCIe 3.0 x16 slot and one PCIe 2.0 x16 slot, but that second slot shares bandwidth with the motherboard’s two PCIe 2.0 x1 slots (its default setting is x2 mode). The motherboard does have three available SATA 6Gbps sockets, and the case has four open 3.5-inch drive bays for storage expansion. This rig can do more than game. I delivered an impressive performance with the productivity-oriented PCMark 8 benchmark, too. 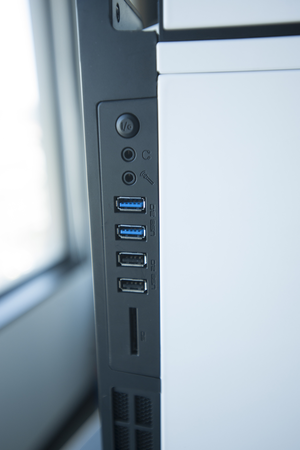 Moving to the front of the tower, you’ll find two USB 3.0 and two USB 2.0 ports, mic and headphone jacks, and an SD card reader. Here I must pick two nits. First, the SD card slot is shallow, leaving part of the fragile card exposed and vulnerable to a clumsy hand or knee that could whack it and snap it. Second, the NZXT enclosure won’t accommodate an optical drive, due to the presence of that sound-deadening hard-drive enclosure. AVADirect maintains that optical drives are “dated” components. While I agree that most users won’t use a DVD drive often, it does come in handy when you buy a boxed game because you want to play it right now and not wait the several hours it might take to download from services such as Steam and Origin. Then again, I suppose external USB drives are cheap enough. 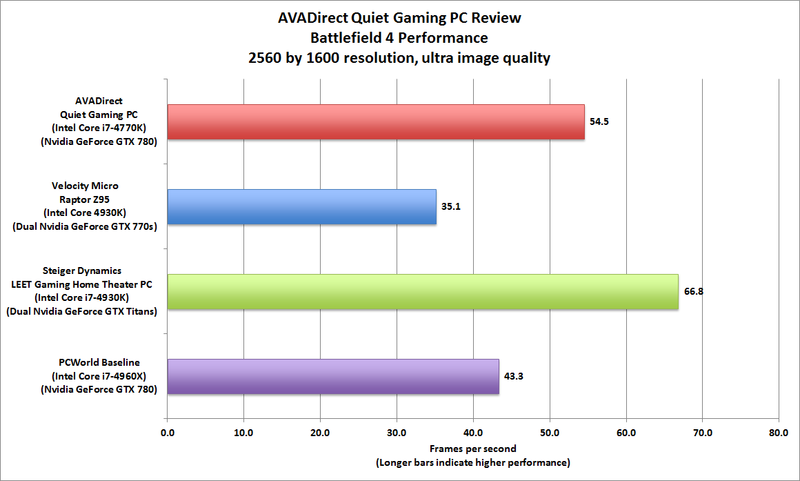 If you’re looking for an affordable gaming tower to immerse yourself in real-time action games and blitz through nearly any home-office job—including resource-intensive jobs like video editing—you should put the AVADirect Quiet Gaming PC on your short list. In our gaming and productivity tests, this machine matches or beats the performance of Velocity Micro’s $3999 Raptor Z95, and it nearly keeps pace with Steiger Dynamics' LEET Gaming Home Theater PC that sells for a staggering $7295. If you’re looking to game at 4K, the equally quiet LEET or Origin’s noise-be-damned Genesis Variable Mounting ($6555) will run rings around AVADirect’s box. But no one would dispute that the Quiet Gaming PC delivers a strong and low-decibel price-to-performance ratio. Understated design that doesn't scream "gamer at play!"